NASSCO just completed its 43nd year and continues to set standards for the assessment and rehabilitation of underground infrastructure. As the association experiences remarkable growth, this series profiles those who have made significant contributions, and impacted the continued acceptance and growth of trenchless rehabilitation methods. This is a bi-monthly installment in a series of articles exploring the history of NASSCO through the eyes of industry leaders. This month, NASSCO honors Brad Dutruch of Compliance EnviroSystems. Since joining the organization, he continues to make major, positive impacts on the association and industry through his participation and leadership. I grew up in Baker, La., a small town just north of Baton Rouge. Its claim to fame is providing shelter to more than 3,000 residents of New Orleans – including more than 500 school-age children – during the immediate aftermath of Hurricane Katrina. The son of Ken Dutruch, a civil engineer, I set off for Louisiana State University in 1995 to follow in my dad’s footsteps and get an engineering degree, but later transitioned over to business administration. During my college years, I owned and operated my own small lawn-care company – cutting grass between classes – and worked for UPS at night, and wanted to learn more about how to build a business from the ground up. Compliance EnviroSystems LLC (CES) along with Joe Atol, my college roommate; Casey Smith, the former director of wastewater for Baton Rouge; and Daniel Miremont. This was before the introduction of the Pipeline Assessment and Certification Program (PACP), so we brought in WRc’s pipeline assessment program to make sure the condition inspections were coded consistently. Over the years, CES has grown at a strong and steady pace, with services today including SSES, disaster recovery, cross bore locating and engineering support. A key differentiator of CES is its ability to utilize our off-road and specialty equipment to get to hard-to-reach areas. States, our first job outside of Louisiana was in Buncombe County, N.C. Located in the Appalachian Mountains near Asheville, our biggest concern was how to get all our inspection equipment up the mountain. We called a trucking company to help and were asked how we get our equipment around Baton Rouge. The answer, of course, was “we drive it!” So, our caravan took off for North Carolina. Joe moved there to manage the project for three years, later relocating to Atlanta. Much of CES’ work has been driven by consent decrees, and around 2002 Atlanta selected CES as one of four evaluation firms to assess its sewer system. We were awarded about 25 percent of the work, and after two years we had the entire southern part of Atlanta, which was a major milestone for our company. Partnering with other NASSCO members through committees, projects and industry initiatives has been an extremely important part of CES’ growth. In addition to opening the door to new business opportunities, NASSCO taught me early on the importance of standards, especially when coding conditions of underground pipe. In 2002 I was in the fifth PACP class ever taught, when NASSCO was located in an attic space in Chambersburg, Pa. I was so impressed with the knowledge that I became a certified PACP trainer to ensure our crews had all the tools needed to inspect and code conditions properly. The first time I attended a NASSCO Annual Conference was in Tucson, Az., in 2004. I received a flyer in the mail and thought I’d check it out. I remember it well because while we were all set for golf in a desert getaway, it snowed. That year the conference had about 59 attendees plus guests. I knew a couple of people, including Mike Hogan and Marlin Gonzales, but it was all new to me. It didn’t take long for me to get involved, however. I immediately saw the value of membership and became active as a member of the board of directors, where I served for seven years, and as president from 2010-2011. One of the greatest ways to contribute to NASSCO and our industry is through committee participation. Over the years I have been involved in the scholarship, annual conference and nominating committees, and have also been part of a trainer review team that approves applications for new PACP trainers. I was also very involved in the development of the Jetter Safety Video. While my contribution of time over the years has been intense, I always feel that I gain more than I give. The most important reason to be involved with NASSCO, however, is its mission to set standards for the assessment, maintenance and rehabilitation of underground infrastructure. Standards in our industry are critical; without them we would be considerably less efficient. Back in the day, for example, Baton Rouge and New Orleans had their own set of condition assessment codes, depending on the engineering firm doing the work. PACP leveled the playing field for everyone and has now become the North American standard. Everyone’s singing from the same sheet of music; a crack is a crack, a fracture’s a fracture, and that’s just the beginning. Operators are trained and don’t have to re-learn a new set of code every time they go to a different job. From a software standpoint, standardization has made it easy to capture and share data in a uniform and consistent manner. 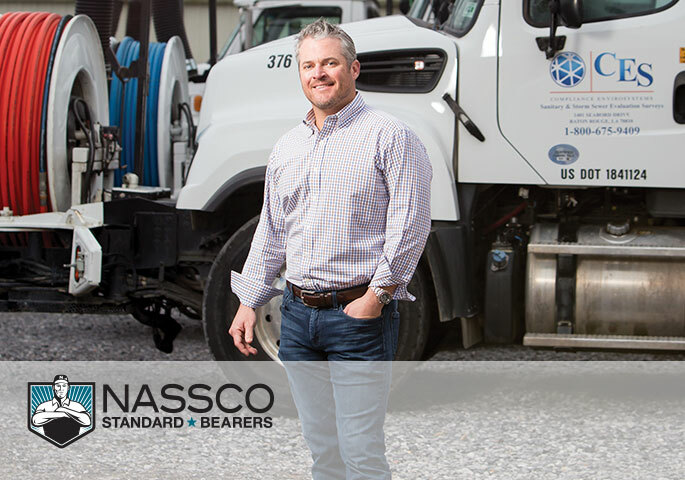 I have seen NASCO grow exponentially from where it was, with roughly 200 member-companies in 2004, to where it is today, with more than 600 organizations representing thousands of industry professionals. My greatest hope for NASSCO is that it continues to remain a strong contractor organization as it was intended. With a solid set of core values surrounding camaraderie, fairness, knowledge and support, I am confident NASSCO will continue to serve our industry with the upmost integrity, and I am proud to be part of that heritage.